Ramon Carulla has been exploring the human condition in paintings, prints and mixed media objects for over thirty years and has sustained a recognizable cast of characters who are as poignant as they are humorous. He exposes the vulnerability of human beings through their actions, and his personalities resonate as familiar to us all. In this series of 32 drawings in ink on paper, he challenges himself to work in black and white, a medium demanding of perfection from the very first stroke. Each subject is a combination of spontaneous drawing with areas remarkable for their detailed obsessiveness. Upon close examination of what at first appears as shaded areas, the repetition of patterns reveals tiny images within images, fish scales, feathers and other compulsive markings. He has no difficulty translating his usual colorful characters into black and white, as they seem to take on a more philosophical temperament in their new, rather serious guise. In order to investigate the human psyche, Carulla looks to his own experiences as inspiration. He has developed a repertoire of personal symbols to accompany each character, while he pays homage to universal references as well. Boats, birds, bicycles, wheels, and masks can be understood at many levels, but they are given unique significance for the artist when combined with his characters wearing their ubiquitous hats and parasols, and understood in relation to his own musings on life. Each character is related to an event, and it is up to the viewer to either identify it as his or her own, or as a subject that can only be seen as an enigma of the artist¿s imagination. Carulla is happy to describe the memories from as far back as his childhood, or as recently as yesterday, that can help to elucidate his subjects and their activities. There is no doubt that with each drawing, his characters appear to be involved in a journey to nowhere, at least nowhere recognizable to the ordinary viewer. They parade in their strange finery, alone or isolated within a group, and even converse while dressed in ridiculous costumes. Somehow they are all related as human beings, or human beings in the process of metamorphosis into or with some animal or bird, who are in a state of concern over their plight. They emote, gesture, and socialize as if nothing was wrong with their very bizarre appearances. There are groups in boat-like configurations that cannot possibly float, and certainly make references to the exile communities of South Florida and their voyages, with which the Cuban-born artist is all too familiar. The Last Voyage serves as an introduction to his repertoire of symbols. Four people share a basket/boat. Two wear fish hats; one a hat made from a boot, and another a hat of feathers. The person in front is winged, and they all appear to have feathers ¿ he was always fascinated by the idea of guardian angels said to protect us as children. There is a parasol, a constant reference in his work to the tropics and the paseos enjoyed by so many in Latin America. A wheel is reminiscent of the last toy he received from Santa Claus before the myth was ruined and a symbol of journeys. There are horses and carousels and circus acts retrieved from childhood memories. Every detail has meaning. Dreams provide the inspiration for many of the titles and may explain the irrational behavior and peculiar appearance of his subjects as aloof and distracted. 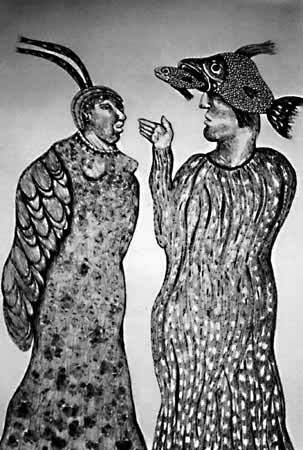 In Remembering a Dream, two men (one with wings) are engaged in a serious conversation, but their absurd costumes and hats make their assocation hard to believe. Dreams are not supposed to make sense, so no explanation is necessary for this work or others in the series. The technique of drawing the feathers and other costume details is provocative enough, especially when he describes hats. Carulla has collected hats all his life. He sees in hats, part of everyone¿s wardrobe, an industry of identity and masquerade that relates to his interest in masks as well. The Venetian carnival aspect of his series is undeniable. The hats and masks are transformative and provide the artist the opportunity to explore his subjects, while never quite revealing too much. Both add a touch of eccentricity and theatricality, as they become a device of disguise and mystery. Ramon Carulla¿s theater of the absurd is his personal vehicle of investigation into the state of the human condition, which is evidently impossible to decipher.